Few instruments can match the expressive range of a piano. From the subtlest, brittle treble to the earth-shattering rumble of the bass – mastering any genre, style or emotion. But it’s not all in the instrument. Just as much comes from the player, the progressions and voicings. If you’re not a pianist, this is the closest you are going to get to having one at your beck and call 24/7. 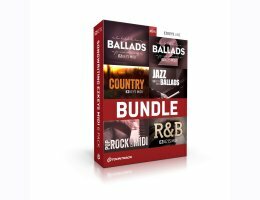 The Songwriting EZkeys MIDI Bundle provides you with professionally played piano parts, all performed in full song structure blocks and in a variety of intensities. It covers anything from traditional country to the dwindling harmonic landscapes of jazz ballads, the distinctive tonalities of R&B and the everyday pop and rock. This coupled with the powerful framework of EZkeys gives you not only instant song ideas, it lends you a creative canvas, ready for you add your own expression to. Do what you love. Love what you do. Make music, it’s EZ.